How do people in Russia predict weather? They simply recall the rich folklore of the Ancient Slavs. 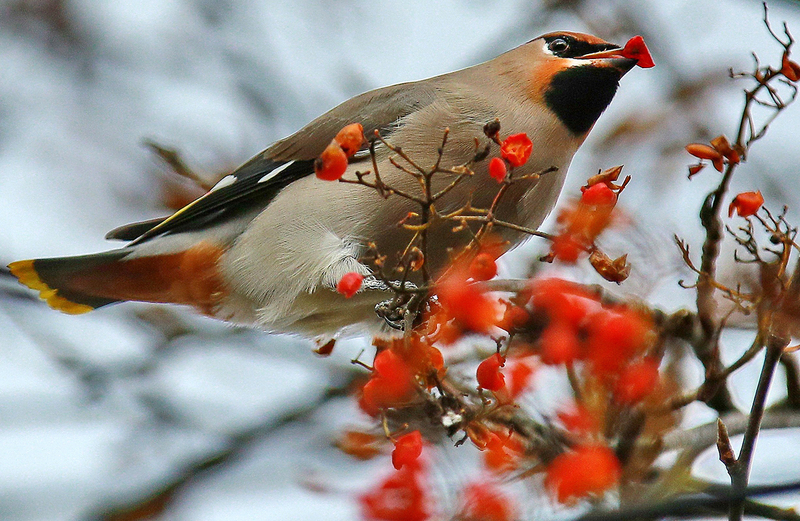 Photo: A waxwing eating rowan berries. Thaws and cold spells, hurricanes and rains – any change in weather can be predicted with some help from the plants, animals and patterns of the natural world. All you need is to remember some signs, discovered by the Russians long ago. Many villages scattered across the vast expanse of Russia still don’t have satellite dishes or even access to radio. So how do people predict the weather to protect themselves and their crops from frost or heat? They simply recall the rich folklore of the Ancient Slavs. Handed down for generations, this traditional wisdom has served like barometers and thermometers for villagers and urbanites alike, helping them to prepare for and contend with the elements. Several examples are listed below. A cat sleeping curled up, covering its nose with a paw, a crow hiding its beak beneath its wing, sparrows seeking refuge in fallen branches or bullfinches making loud calls – these are signs indicating that it will soon become very cold. This is intuitive since cats, crows and sparrows look for warm places to hide from the cold. Bullfinches, however, are winter birds and welcome the cold because they are happy to feel their favorite season approaching. This traditional wisdom is also used to predict winter’s thaw and the coming of spring. Some signs of an upcoming thaw include blue skies above the forest or short dawns. Additionally, smoke rising from a chimney in a straight, uninterrupted column, heralds good weather, while erratic smoke patterns tell of a coming storm. The long, harsh Russian winters have always made people eager to search for signs of thaw as they look forward to spring. Since the old days, Russians have believed that when snow starts melting on the north side of the house, skylarks arrive and the cat starts sleeping on the floor, it means that a thaw is coming shortly and will stay for a long time. However, if chaffinches start flying around, snow melts on the south side of the house and there is a lot of water flowing everywhere, then, unfortunately, the cold will be back in no time. Russia’s summers are short and, in many regions, dry. No rain can mean no harvest, so in the summer people kept an eye out for flowers closing, frogs croaking in ponds, crawfish crawling onto riverbanks and finally, long, continuous spells of thunder. These are all signs of a coming rain. Another summertime scourge of the Ancient Slavs was sudden cold snaps. For this reason, people watched birds, bees, and the sun. If birds caw loudly and fly low, bees swarm, and halos are visible around the sun, one should prepare for a chill. The main forecasters of fall are the arrival of rowan berries, mushrooms, nuts, ducks, hares and squirrels. If rowans flower late, then the fall will last longer. If they produce a lot of fruit, the winter will be cold. However, if their leaves wilt but don’t fall off, lingering for longer than usual, then intense freezing weather is sure to come. If there are a lot of nuts, but mushrooms are scarce, the winter will be snowy and hard. Ducks swimming in rivers, even in cold rain are believed to be a good sign because this means the winter won’t be coming soon. If hares’ fur begins to turn white and squirrels build their nests high up in the trees, a cold and difficult winter is to be expected.